The Swedish energy distribution company Skellefteå Kraft has chosen Aidon as the supplier of its next generation smart metering system. Aidon’s total delivery covers a head-end system, energy service devices and an RF-based communication solution. Skellefteå Kraft is one of the first DSOs to invest in a new metering system which complies with the new functional requirements specified by the Swedish Energy Market Inspectorate last year. The new system will provide Skellefteå Kraft with a range of advanced features and significantly larger amount of data with a possibility to monitor the status of their grid and the quality of supply. The company’s customers will benefit from the new system so that they will receive more accurate information about their energy consumption and the possibility to control it. Implementation of the new system will start this summer. – Our task is to offer our customers a secure supply of electricity in the future, while having an efficient operating environment and a well-balanced grid. With Aidon’s solution we gain access to advanced functionality in a metering system that is also future-proof, says Clas Berglund, head of grid department at Skellefteå Kraft. – We are delighted that we will be involved in developing Skellefteå Kraft’s electricity network. In Sweden, the next phase of smart grid development is about to begin, and these first DSOs serve as examples to others, says Fredrik Rex, managing director of Aidon in Sweden. 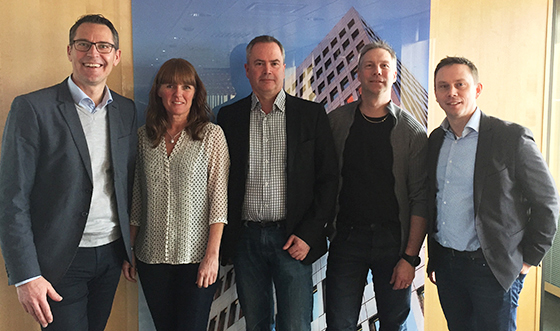 From left: Fredrik Rex, Managing director, Aidon in Sweden, Lena Sarlin, Measurement engineer, grid department, Skellefteå Kraft, Per Högelin, Sales manager, Aidon, Crister Persson, Buyer, Skellefteå Kraft, and Clas Berglund, Head of grid department, Skellefteå Kraft. Aidon is a leading provider of open-architecture based smart metering and smart grid technology and solutions in the Nordics. Our solutions cover more than 1.3 million metering points in the Nordic region. Aidon has offices in Jyväskylä and Vantaa in Finland, Täby in Sweden and Asker in Norway. Skellefteå Kraft is driving the development of renewable energy through investments and research. We are one of the largest power producers with the production of wind and water, heat and bioenergy. Our target is to have 100 percent sustainable own energy production.